The AMSAT P2B (OSCAR 7, Phase 2B) satellite was a small communications satellite designed by amateur radio operators of AMSAT-NA. 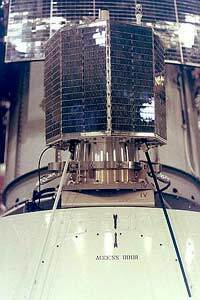 The satellite body consisted of a octogonal prism, with surfaces covered with solar cells to provide electrical power. Passive attitude control was accomplished with a magnetic and damping rods. AMSAT P2B carried two beacon experiments (near 30 and 430 MHz), and two repeaters with code storage capability. The receiver operated at frequencies near 146 and 432 MHz, and the transmitter on frequencies near 30 and 146 MHz. The command system was built in Australia and the second repeater in Germany. The satellite was launched on the 15 November1974 on a Delta-2310 rocket as a piggy-back payload together with NOAA 4 and Intasat from Vandenberg AFB into a 1450 km × 1455 km orbit with an inclination of 101.7°.